Police crackdown on demonstrations against targeted attacks on Ethiopian migrant workers in Saudi Arabia. Police in Ethiopia have arrested dozens of people outside the Saudi embassy in the capital Addis Ababa in a crackdown on demonstrators protesting against targeted attacks on Ethiopians in Saudi Arabia. Police units blocked roads on Friday to prevent the protest at the embassy from growing and forced some journalists to delete photos. "The police came and they beat us… and now more than 100 people are at the police station. One protester, Asfaw Michael, who was beaten, said he did not understand why Ethiopia wanted to shield Saudi Arabia from the protest. "The police came and they beat us…and now more than 100 people are at the police station," said Getaneh Balcha, a senior member of the opposition Blue Party movement, adding the party chairman and vice chairman were among those held. "It was an illegal demonstration, they had not got a permit from the appropriate office," Shimeles Kemal, a government spokesman, told the AFP news agency, adding charges could be brought against the organisers. 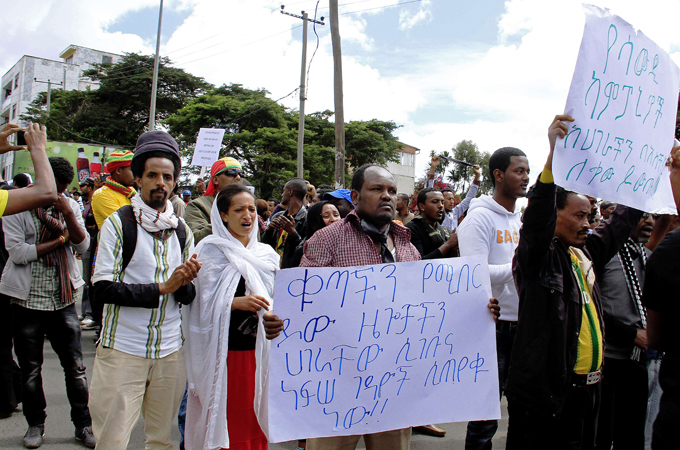 "They were fomenting anti-Arab sentiments here among Ethiopians … the demonstration itself was illicit, so the police took measures and apprehended some," he said. Many foreign workers in Saudi Arabia are fleeing or are under arrest amid a crackdown on the kingdom's nine million migrant labourers. Close to 500 Ethiopians have been repatriated. Last weekend, Saudi residents fought with Ethiopians and a video emerged of a crowd dragging an Ethiopian from his house and beating him. The security sweep in Saudi Arabia comes after seven months of warnings by the government, which has created a task force of 1,200 Labour Ministry officials who are combing shops, construction sites, restaurants and businesses in search of foreign workers employed without proper permits.